The image our group was given was of a small scene from the side of a Roman sarcophagus. 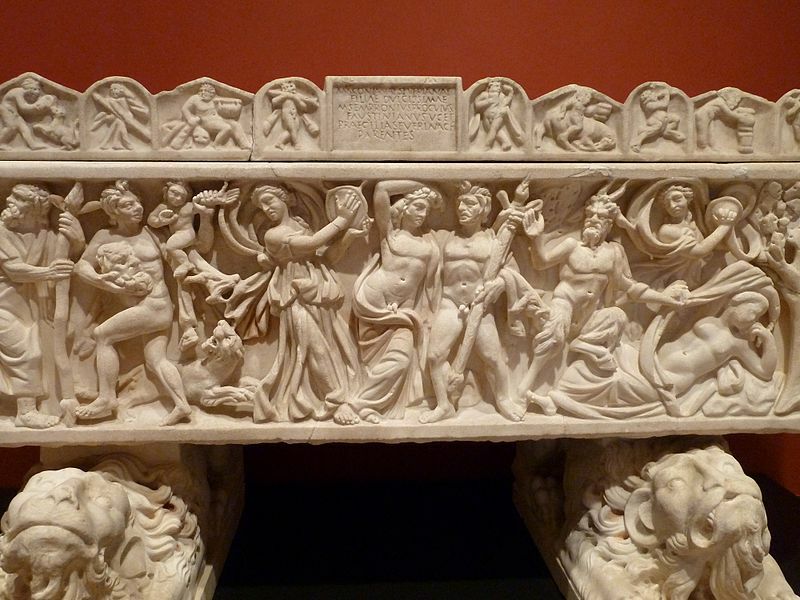 The sarcophagus was made of marble and belonged to a little girl. There is a Latin inscription above the carved scene that identifies the girl as Maconiana Severiana, the daughter of a wealthy senatorial family in Rome. The carvings on the side of the small sarcophagus are scenes of Bacchus. Bacchus was the Roman equivalent to Dionysus, the god of fertility and wine, and a patron of the arts. The scene depicts the wedding of the Greek Dionysus and Ariadne. In Greek mythology it is said that Ariadne, the daughter of King Minos of Crete, assisted Theseus on his quest to slay the Minotaur. It was once the two made it to the island of Naxos, that Theseus abandoned her while she was sleeping. Dionysus found Ariadne there and took her to be his wife. Some mythology says that Ariadne had been granted immortality, however, other sources claim that she was later slain by the Greek goddess Artemis. It is assumed that the face of Ariadne was purposefully left blank to be filled in with the portrait of Maconiana. The main body of the sarcophagus was created between 210 and 220 C.E. It was found in Rome, Italy, in 1873, and in the 19th century, after the discovery of the sarcophagus, the legs were added on. The legs are marble sculptures of resting lions that complement the carvings on the sarcophagus itself rather nicely. Currently, the sarcophagus belongs to the J. Paul Getty museum in Los Angeles, in the United States.